From the LMMS.io website: 'OpulenZ is an emulation of the Yamaha YM3812, a.k.a OPL2, FM synth chip which was used in sound cards around 1990 - the Adlib and Sound Blasters.' It's included in the Linux MultiMedia Studio (LMMS) Digital Audio Workstation. 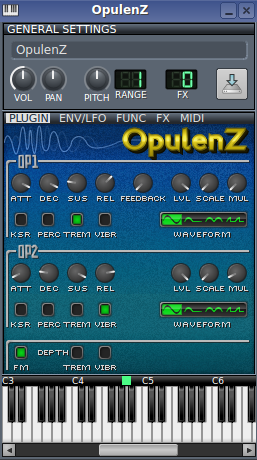 OpulenZ consists of 2 oscillators. The two oscillators (operators) can either be routed separately to the output, or oscillator 1 can modulate oscillator 2 using the FM button in the lower-left area of the GUI. Each operator has its own ADSR envelope, as well as keyboard scaling rate (KSR, or key follow), Perc (sustain is bypassed), tremolo and vibrato (both of which can be accentuated with the Depth Trem and Vibr buttons). Both operators are also equipped with Output Level (LVL), Scaling and Frequency Multiplier (MUL) buttons. A Feedback switch feeds part of operator 1's signal back into itself. OpulenZ's two operators provide the following waveform options: sine, half sine, absolute sine and quarter sine. The Env/LFO window is not active in OpulenZ, but the Function (note stacking and arpeggio), FX chain and the MIDI windows are all accessible. A few presets: OpulenZ Patches 14 Sept.17 Unzip the compressed file into your ~/lmms/presets/OpulenZ directory. Refresh the (starred) LMMS presets window. Drag the desired preset unto the instrument track to load it.